Objectives | ProSurf - High Precision Process Chains for the Mass Production of Functional Structured Surfaces. H2020 Project. ProSurf aims to transfer a selection of advanced methods for surface modification into industrial mass-production lines that use replicative processes. Replication is the established method of choice for mass-production of polymer and, in several cases, of ceramic goods. Therefore, replication-based production is of highest relevance when one aims to improve the cost/performance ratio of mass-products. In addition, structuring replication moulds in established process chains avoids the complex problems that in-line structuring creates. To ensure that ProSurf’s methods can easily be implemented, in particular if several surface modifying methods are to be combined, we go beyond isolated technology development; we mirror the entire production process including handshake between different stages, off-line and in-line quality monitoring, and modelling (cf. Figure 1). In consequence, the results of ProSurf would cover a broad scope of applications and have a vast potential to trigger further innovations. To showcase the performance of ProSurf’s solutions, we will carry out demonstration studies improving actual products of our industrial consortium members. Objective 1: Using the capabilities of the methods for structuring and for replication as boundary conditions, we will develop modelling tools to translate a desired functionality into geometrical surface structures. We aim to go beyond mere bio-mimicry and push towards revealing the underlying physical principles. Such deeper understanding will lead to optimized ‘non-obvious’ structures. 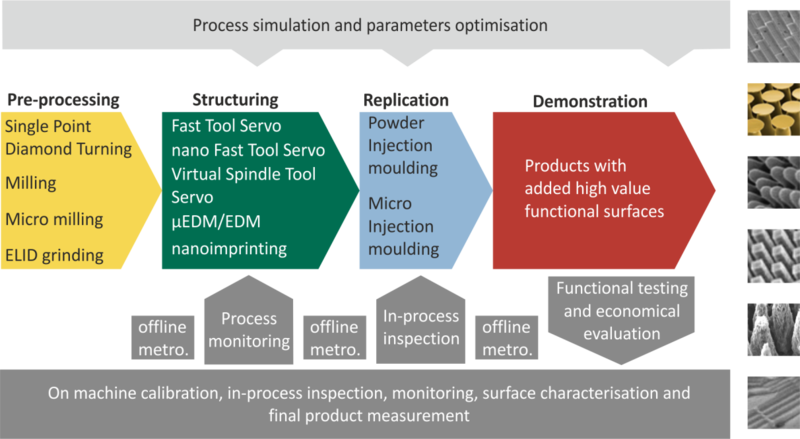 Objective 2: Develop methods for surface modification up to TRL 6: Nanoimprinting, nano Fast Tool Servo (nFTS), Virtual Spindle Tool Servo (VSTS) and µEDM/ECM. These technologies offer a wide range of micro and/or nano structuring capabilities and can be implemented either stand-alone or in combination. ProSurf aims to show that the selected methods are capable to improve existing products by adding structures specified under Objective 1 to moulded products within existing replication process chains. Objective 3: Mass-produce complex products by highly precise replication technologies, such as micro injection moulding (µIM) and powder injection moulding (PIM). Thanks to the involvement of our industry partners, we can employ state-of-the-art manufacturing strategies and algorithms to optimize processing. Objective 4: Implement a strategy for process and quality control. The strategy will include tools for in-line and off-line measurements to ensure that the moulds bear the desired structures, that the structure is reliably transferred to the product, and that the product shows the desired added/improved functionality. Objective 5: Validate the developed tools in six product demonstrators: surgical lenses with holographic surface, optical connectors with anti-reflective function, tribologically optimised sensor cap and mould, adhesive contact cleaning rolls, plastic consumer products with built-in decoration, and transparent hydrophobic surfaces for automotive components.